You’d think that with all the cycling I do, I’d be sick of it now. But who can resist a good steep climb in the Swiss alps on an unloaded bike. I borrowed some good maps from Jean-Richard and headed up to Col du Sanetsch (2252m). The weather was brilliant, with magnificent views of mountains on both sides of the valley. Curve mirrors placed just right so that you can see the other side of the valley without even turning your head. The road passes though incomprehensibly steep vineyards. I was expecting more green fields of grass, but in the Valais region, it’s all about the wine. 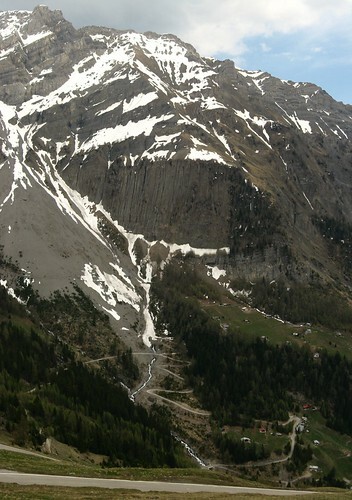 Towards the end of the steep valley that leads up to Sanetsch Pass, the road zig zigs up the steep valley head walls. It is peaceful here. Just the sound of the wind and gushing rivers. A great place for a mountain crib. 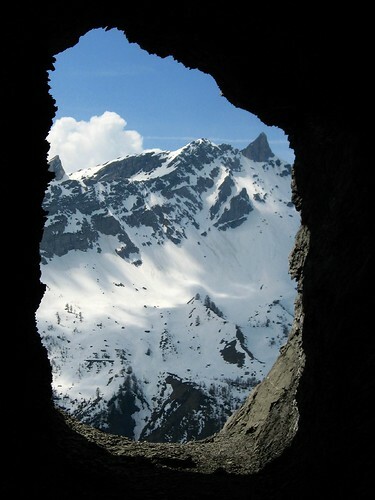 From about altitude 1900m, there was still snow and uncleared rocks that the snow had left behind when it melted. The 800m long tunnel at about 2000m had a lot of fallen rock inside. I ditched the bike just past the tunnel and walked through the snow up to the pass Col du Sanetsch. I had no socks on so snow that fell into my boots numbed my feet. Massive mountains were dwarfed by massive clouds. In summer, you can take the bus up here. Wow. I am so jealous of you right now!!! @ Anna – Yeah, this is a great country. Not just the mountains…unique laws, secret banks, very rich country…deep is what I would call it. I don't know when you crossed the language border to the French part but if you are in Evolene (I think that's the area where you will be working) try cheese fondue at the local restaurant. Don't attempt to ride a bike after that becos the fondue is made with the local wine and cheese – watch the wine bit. mmmmmmmmmm I still remember the smell and taste of it. You are between Jungfraujoch and Matterhorn basically. Enjoy the rooftop of Europe. amazing to see photos from "my region". I'm coming from Arbaz, 10 km from Sion, and I spend 6 month in NZ! I invite you to contact my wife Esther at home. 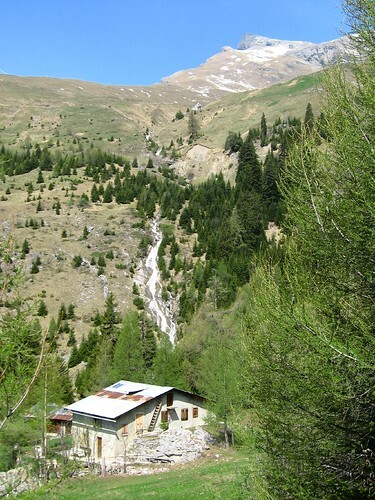 She can feed you and give you a lot of good advices about what to do in the Central Valais. For April it is 5 degrees too warm, for and that explains, why you were able to climb onto the Sanetsch, outherwise this trip is out of any question in springtime – without skis. Rudolf, I know what you mean about it being very warm. Many of the locals are saying it is 10 degrees warmer than it should be. The other night I was at an outside cafe/bar with some new friends in the middle of Sion, and a nearby digital thermometer was registering 24 degrees celcius. That was at 10:30pm! I wonder how many folk reading your blog understand what a mountain crib is? Those of us brought up in the south of the South Island of NZ will or anyone from Scotland or familiar with Scottish words. Aunty Les, I put the 'crib' word in on purpose to make sure that people had exposure to correct English. There are so many people out there that think they are speaking correct English, but really have only been fooled into a false sense of understanding. The way of the future is dirrrrrty purrrrple worrrrrk shirrrrrts while luxing the floor at the crib. I will, however, layer up the 'correct English' sentence even further: dirrrrrty purrrrple worrrrrk shirrrrrts that need washed while luxing the floor at the crib.